If You Have a Friend on Facebook - Let them Know About This Item!!!! 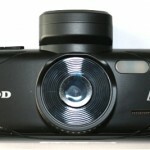 The DOD LS460w dash camera is one of those things people seem to need after the event has happened. The car camera should be invested in before anything happens – rather than later. The LS460W from the manufacturer DOD is under review here, as we have an actual unit and are giving it a good going over. Note, there is no USB cable within the camera package, but one arrived in the same outer package – and that was branded with the DOD logo aswell – so all is good. Earlier versions of the firmware on the LS460W did not correctly format memory cards above 32GB (there was a windows workaround for this, a program could be used to do the format on a computer), however, we have been informed that the current version of the firmware now caters for the formatting of the memory card you choose for your dash camera, whether it be a 32GB or 64GB (which is the maximum). In the list above you will have noticed that we mentioned two mounts, there are two indeed, one is the sticky type of mount whereby the bracket is adhered to the windscreen of the car for permanent fitting, the other is a suction mount, similar to those found on GPS systems and allows the owner the freedom to move the camera from one car to another should this be desired. Bearing in mind there are two mounts, we thought this was useful as it means that two cars can share the camera without having to switch mounts around. The power cable will still need to be moved though, because whilst these are available as an additional separate item, the usual single cable only is supplied. The camera itself feels “solid” and has “weight” to it, some car cameras are so light you can hardly imagine any electronics in there – more like holding an empty crisp packet. 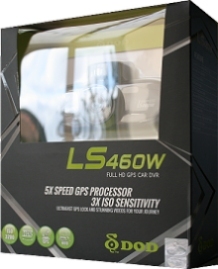 The LS460w though is firm and solid. The menu us very easy to use, once you get the hang of the buttons. Basically there is a menu button which activates a menu which pertains to the current mode the camera is set to. For example, if you want to enter a menu with parameters for adjusting the video settings, then you would press the menu button when the camera is in Video Mode – rather than Photo Mode. Pressing the Menu button in Photo Mode brings up an entirely different set of options than the video mode as one would expect. Traversing the menu is very easy – a bar highlights the current option and this can be moved up and down using a couple of arrow keys on the side of the viewing screen. Selecting an option using the top OK/Record button offers the owner the actual settings under the chosen option. For example, if you require to set Motion Detection to OFF instead of ON, then you would press OK/Record with the bar over “Motion Detection”, then use the arrow keys again to choose between the displayed options of “ON or OFF” pressing OK/Record with the option selected will set the parameter and return the owner to the main menu. Memory cards must be of a class 10 high speed and no fakes – we used a 32GB samsung card for our review here during the trials. This gave us around 4 and a half hours of recording before the camera started looping and deleting the old footage. More than sufficient for our purposes including in our real life situations of using the camera for real as it were. Please note that some people are selling memory at high prices and the cams at low prices. Where you see a seller offering memory as well, always shop around because they are generally rip-off merchants. Driving with the camera installed in the vehicle was just as it always is, although at first we were a little conscious of the presence of the filming and this resulted in our driving more carefully, as the cams are a double edged sword – always remember that in actuality you yourself are being recorded as well as the other road users around you. When we turned on the engine, it beeped and started recording, it stopped recording when the engine was switched off, it also powered itself down. So it was fully automatic and could be described as plug and forget technology. Playing back the videos we produced on the DOD LS460W was simply a case of connecting the camera to our PC using the USB cable – although it should be said that this is not required, the memory card can be removed in the car and taken to a PC which has a card slot. This is quite a trivial matter but could be useful for some readers. We copied the video files to the hard disk, and then, loaded up the DOD software player and opened them up. 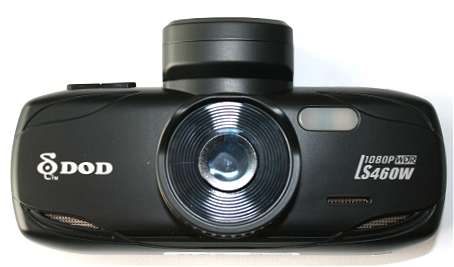 The video quality is extremely clear, the best we have seen from a dash cam, and the software connected with Google maps and showed mapping images along with GPS speed and co-ordinate information. As an accident or evidence camera this will more than do the job for both casual road users and commercial users. It has no problem picking out number plates and also records exceptionally well in the dark (with the aid of street lighting and headlights). Gauntlet Birds of Prey for a Family Day Out. Stockport Manchester Cheshire Responsive Website Designer.